The report of the committee probing the clashes that took place during the recent Parliament sessions has accused fifty-nine parliamentarians regarding the incident. The committee had handed over the relevant report to Speaker Karu Jayasuriya on January 22. Reporting the contents of the report, the BBC Sinhala Service said, 59 legislators have acted against the provisions of the Parliament (Powers and Privileges) Act. 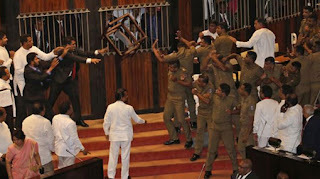 Accordingly, 54 MPs of United People’s Freedom Alliance (UPFA), 4 United National Party (UNP) parliamentarians and one MP of Janatha Vimukthi Peramuna have been held accountable for the violent situation in the Chamber. Reportedly, the report has cited the name of UPFA MP Prasanna Ranaweera in 12 charges, while MPs Johnston Fernando, Padma Udaya Shantha, Dilum Amunugama, Ananda Aluthgamage, Indika Anuruddha, Mahindananda Aluthgamage, Palitha Thevarapperumam Ranjan Ramanayake, Arundika Fernando, Niroshan Premaratne are also among the accused. The report has estimated the damages caused to Parliament properties during the clashes at Rs 325,000. Rejecting the claims that incidents inside the Parliament are covered by the Parliament (Powers and Privileges) Act, the report has emphasized the need to take disciplinary actions against these MPs. Meanwhile, MP Kumara Welgama has stated, MPs should not be penalized over this incident, as it was caused due to the ignorance of the parliamentarians.